Close your eyes and imagine your perfect wedding day. You're probably wearing something white and gorgeous, you're surrounded by your best friends, and the smell of flowers hangs in the air. It's that last part of your dream wedding that is the exclusive domain of wedding florists, and it is their creativity that allows brides and grooms to decorate with stunning backdrops, bouquets, boutonnieres, and tablescapes. 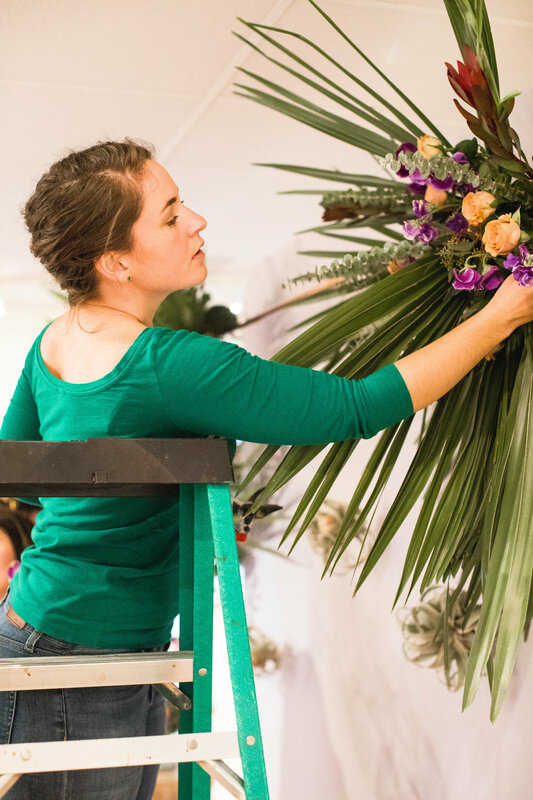 Today, we're taking a peek behind the scenes at Propagate Studio, where owner Hannah Archer designs elegant, personalized floral arrangements for couples across the Lowcountry. She shares her recent business triumph, why she's glad to be back in Charleston, and what she's looking forward to the most. I NEVER thought I would be in the wedding industry! It started in college with a few internships, and blossomed from there. When I lived in Connecticut (we just recently moved back to Charleston), I worked for an incredibly talented floral designer, and she is a huge inspiration to me. That's is when I really got to focus on floral alone, and now I love to make it as creative as it can be! Get to know as many people in the industry as you can. Sometimes it is hard to do that, especially if you typically work alone, but everyone here has so much to offer! What is the best part about working/living in South Carolina? I'd have to say, the community is one of my favorite parts of being here. Everyone is very welcoming, and genuinely interested in what you're doing. Even just in your regular coffee shop, you can find that sense of home so easily. I hosted a launch party for Propagate Studio at Miller Gallery a few weeks ago, and the successful turnout made me feel that much more confident in my new venture. The support from everyone, even those who couldn't be there, was overwhelming! I feel so lucky to be back in Charleston where I can build such a wonderful home base. I have been in business on my own for a very short amount of time so far, but there are already so many exciting plans ahead.